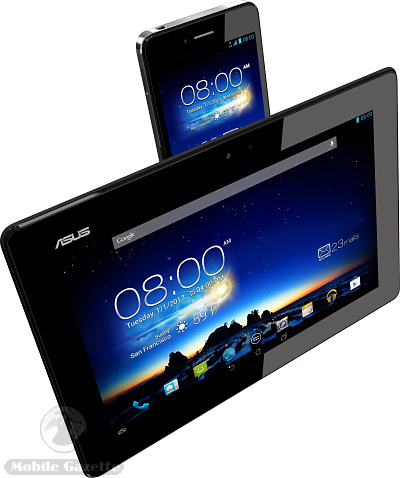 The quirky ASUS PadFone 2 only hit the market a couple of months ago, but ASUS have already come up with an improved version called the ASUS PadFone Infinity. What they intend to call the next version we don't know, because (of course) Infinity plus One does not exist. Anyway, at first glance, the PadFone Infinity and the PadFone Infinity Station dock look almost identical to the PadFone 2 and its station, but even though there are few differences, they are pretty significant. The biggest change between the PadFone Infinity and the PadFone 2 is the display - the Infinity has a 5.0" 1080 x 1920 pixel full HD Super IPS panel, where the older version had a more modest 4.7" 720 x 1280 pixel screen. This graphics boost translates to the PadFone Infinity Station which is now a 10.1" 1920 x 1200 pixel unit, and this makes more sense than the old 1200 x 800 pixel panel. The PadFone Infinity and PadFone Infinity Station are now fully HD compatible, and the PadFone can output to an HDMI TV via an adapter. This is an Android 4.2 device with some of ASUS's own applications on top, including SuperNote for note taking, Story for creating photo albums and a voice control application called ASUS Echo. Of course this is all very clever but you might be wondering why you should want such a thing. But the answer is that is keeps synchronising data and settings between your smartphone and tablet simple, because the tablet is the smartphone. But all this convenience comes at a cost - €999 to be exact - and there are some other drawbacks which we will get to later. Inside the PadFone Infinity is a 1.7GHz quad-core Qualcomm Snapdragon 600 processor coupled with 2GB of RAM and 32 or 64GB of onboard flash storage. The PadFone Infinity comes with a hateful nano-SIM slot though, so you won' be able to swap in a micro-SIM from another smartphone. 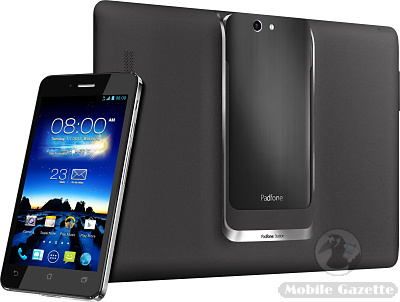 The PadFone has a large 2400 mAh battery, and the PadFone Station has a 5000 mAh cell of its own. The docking station can be used to recharge the smartphone component, so you should come away freshly juiced. There's a 13 megapixel camera on the back of the phone (which also works in the Station) plus a 2 megapixel front-facing one in the PadFone and 1 megapixel one in the Station. The PadFone Infinity is an LTE capable device which also supports HSPA+ and all the usual cellular standards. There is broad WiFi support, Bluetooth 4.0 and NFC and the PadFone Infinity also comes with GPS and GLONASS positioning, plus a whole bunch of sensors. The PadFone Infinity Station has its own RF antennas, so it doesn't have to rely on the ones in the smartphone. Put together, the whole package weighs 671 grams which is a little heavier than the iPad 4, but then the ASUS has a larger display and is a bit less efficient because of the docking mechanism. The PadFone Infinity itself measures 144 x 73 x 8.9mm and weighs 141 grams, the Station measures 265 x 182 x 10.7mm and weighs an additional 530 grams. This is all well and good, but at a shade under a thousand euros this is a pricey bit of kit. But there's a more significant issue - if you break or lose your PadFone or the Station then you have to replace it with an identical one, as the PadFones and Stations are not compatible across generations, so if either component is out of date then you potentially have a very expensive problem. If you are the sort of person who gets through smartphones on a regular basis then it is worth bearing this in mind. ASUS say that the PadFone Infinity should be available in Taiwan in April followed by selected other countries from Q2 2013 onwards.